We are pianists (or aspiring pianists) and art is our realm – but this doesn’t change the essence of the most effective productivity/health/self-confidence secret of all times: working out will transform you, your attitude, your belief system, your piano playing habits, your personal and professional achievements and the overall quality of your life! Most pianists are unaware of this universal truth. They focus 100% on their practice, spending many hours per day at the piano – and they work hard, often sacrificing their health (especially the straightness of their spine) for achieving their musical goals. I have great news: Things don’t have to be this hard and boring! Becoming a good pianist is not easy – but it can be fun, enjoyable and tension-free! All you need is a change of perspective: understanding that musicians don’t have to be slouching geeks or fragile mademoiselles – they can and should be fit, strong and healthy warriors, inspiring their audience, bringing them light, positive energy and motivation! This is the first episode from a series of workout tutorials designed especially for pianists – an easy yet very effective warm-up routine for our fingers, wrists, elbows and shoulders. I decided to dedicate the first episode to our arms and wrists because we ARE pianists :), and also because this is the easiest part of a holistic whole-body warm-up that I do every day and that helps me to stay in shape and feel awesome! My intention is to share all the elements of this warm-up step-by-step, according to their difficulty level – so that you’ll be able to integrate them in your daily routine gradually, in a comfortable painless manner ;). In the next episode we are going to focus on our spine – and I’m going to show you a very useful warm-up and stretching routine that will help you to improve your posture and get rid of back, neck and shoulder pain! The next workout tutorials will be available only for the members of my Piano Coaching Program at PianoCareerAcademy.com. Join this program and get instant access to hundreds of detailed exclusive piano playing tutorials that reveal the secrets of the Russian piano school via my holistic approach on piano playing, music and lifestyle! On the Private Members Forum you’ll also be able to ask me ANY piano question, anytime, and receive personalized, detailed, professional piano advice! Piano playing is not a unilateral mind-finger-instrument activity. It is an amazing holistic experience that incorporates spirit, mind, body and emotions. Working out on a regular basis will help you to harmonize all these aspects of your existence, at the same time compensating those long hours of static piano practice. The result? The new-found balance will inevitably reflect in the quality of your piano playing! Many new articles and video tutorials are coming soon on PianoCareer.com. Follow me on Facebook, Twitter or Google + (and now also on Pinterest!) to get instant updates, support and motivation! As someone who has experienced some elbow discomfort after practicing, I have found that some simple stretching exercises have really helped. I looked forward to trying your more comprehensive stretching routine. Thank you so much! Thank you so much for this! Is there anyway you could write it out with photos, so I can print it, to do at school? It’s brilliant, and I’ve tried it – it really helps keep practice tension free! Presenting each exercise with pictures is a brilliant idea – but unfortunately this would require lots of time! If I find the time, I will post the next workouts in a video+pictures format (they will be available for the members of my Piano Coaching Program at PianoCareerAcademy.com). Thank you for your comment and have an enjoyable practice! Im not sure if I’m posting on the right page but I need help with playing arpeggios. I don’t know if you have a video for this or an article, I haven’t found anything related to this topic. my problem is “the wrist’s position” while playing them. previous teachers have told me I must not twist my wrist but rather try to ascend and descend by using the arm, and so I do. however, in playing arpeggios I can’t find a way for my thumb to move/leap an octave (under the other fingers) and keep my wrist straight at the same time. my hands, fingers, arms and shoulders are totally relaxed and have good elasticity too but I still cant manage. can you kindly help me with this? As a matter of fact, there are many detailed video tutorials dedicated to this exact problem on the Private Members Forum at PianoCareerAcademy.com! There I demonstrate how to keep your wrist when playing scales and arpeggios: you definitely don’t need to keep it ‘straight’ – especially when performing thumb crossings! It should not ‘twist’ either – here your teachers were perfectly right. Instead, your wrist should be flexible – and anticipate the layout of the arpeggio. It’s difficult to explain this technique in words – watching the videos would be much more useful! Another important thing to keep in mind is the correct thumb position and functionality. Here the wrist plays a key role – being flexible and going slightly upwards each time we perform a thumb-under crossing. You can find many videos on this subject as well on PianoCareerAcademy.com – there I show in detail how to perform thumb crossings in playing different types of scales, arpeggios and pieces. It’s great that you’re keeping your arms relaxed! From what you wrote it seems to me that now you have to concentrate on improving your wrist technique. In the Russian piano school, we don’t call wrist movements ‘rotations’, ‘twisting’ or ‘ascending and descending’. Instead, as I said above, we use the term flexibility: the wrist is totally loose and relaxed, anticipating the texture, structure and specific ‘layout’ of the musical text. This helps us in thumb crossings and hand position changes – being also the most important thing when it comes to tone quality and expressiveness (not to mention the fact that a flexible wrist is the best antidote against tension and the resulting pain!). I just joined your academy. Im exited to start studying your methods. thanx for your help, c u soon. I stumbled upon your website by chance when seeking answers on the net for hand injuries for pianist. Im an intermediate piano student taking my ABRSM grade 7 next year. Your informative articles and warm ups video is a godsend. None of my previous or current teachers taught me to do warm ups before practicing. Im now nursing an injured left pinky and sore hands each time I practice nightly. I just started doing your warm ups exercise before practising and also put ice after and noticed it helps a bit with the soreness. Thank you so much! Thank you for your comment! 😉 I’m really happy to hear that my warm-up video have helped you to reduce your hand soreness! And, the most important secret: don’t forget that the main cause of hand injuries is incorrect practice (incorrect posture, tensed playing etc.). The only way of really getting rid of your hand soreness is learning how to play correctly, with relaxed arms and wrists, by using the whole-arm action principle. Seriously, thanks so much for these stretches. These have helped my 53-year-old hands and wrists become a little more flexible at the keyboard. I did overstretch at first and that caused me some pain and stiffness. Since recuperating from that, I’ve learned to stretch more gently, just to the point of tension – not past it, and I’m having benefits from that. I have just discovered your website. It is really good. Well done! I studied piano on the graduate course at the Guildhall School of Music, London twenty years ago. While there I developed repetitive strain and felt no-one gave me any advise what to do. I am now a piano and singing teacher as well as a performer, mostly singing, but also playing at the piano my own songs. I recently, in the last few years had pains in my hands again and am working at achieving a relaxed piano technique. I particularly like your warm up exercises. The exercises go by so quickly though, that it is really hard to follow and remember everything. I was wondering if you had thought about bringing out a DVD for people to buy where they can follow the routine with all the repetitions? I was also wondering where are you based? If you were in London I would be interested in a few lessons looking at posture/technique. Thank you for your comment and your appreciation! I’m sorry for the delayed reply – all emails/comments are answered chronologically :). I particularly like your warm up exercises. The exercises go by so quickly though, that it is really hard to follow and remember everything. The spine warm-up routine that you can find on YouTube is simply a preview (a quick sneak peek) of the actual video, which can be found in the Members Area of Ilinca’s Online Piano Coaching Program at PianoCareerAcademy.com. The video is filmed in real-time, and you can easily follow and remember all exercises. The video above (arm&wrist warm-up), however, is complete (not a sneak peek), being available for free here and on YouTube. I was wondering if you had thought about bringing out a DVD for people to buy where they can follow the routine with all the repetitions? PianoCareerAcademy.com offers its members an ENORMOUS database of tutorials (the equivalent of hundreds of books and DVDs), which you can access for only $47 per month. Plus, new tutorials are being posted on a weekly basis! PianoCareerAcademy.com is the only Piano Coaching Program on the internet that shares the professional principles of the Russian piano school in a detailed, holistic, very in-depth manner – offering its members premium quality tutorials that cannot be found anywhere else (unless you study with a professor trained in a Russian-style Conservatoire). Once you become a member, you’ll have instant access to our ENTIRE database (there are NO limitations): hundreds of exclusive video and written tutorials (including step-by-step courses) focused on the most important piano playing topics, being structured according to categories and levels. We also share many scores and teaching resources (including unique materials we use in the Russian piano school). Besides the enormous database of existing tutorials, Ilinca is also posting new ones on a regular basis. 1. Piano Masterpieces – Detailed Video Lessons for All Levels. Ilinca takes one piece at a time (alternating levels, styles and genres) and she analyzes it in detail, also sharing LOTS of practice tips. 2. Practicing Scales and Arpeggios – The Art Behind the Exercise. This step-by-step holistic practice guide comprises many progressive episodes, covering the entire scale system we use in the Russian piano school, with super-detailed practice tips for every level. 3. Nikolaev – Russian School of Piano Playing. Step-by-Step Video Practice Guide for Piano Beginners. Even though this practice guide is designed for beginners, experienced players (and even teachers) can benefit from these lessons as well! 65 detailed Lessons are already LIVE – and Ilinca continues to post a new lesson each fortnight (on Thursdays). Besides teaching the secrets of a correct, productive and enjoyable piano playing, our Piano Coaching Program also helps each student to grow, to discover his/her unique talents, to learn more about the psychological aspects of musical performance (including how to increase our confidence, how to get rid of performance anxiety etc. ), to improve his/her health and well-being and so on. On our forum you’ll also find support and motivation – and an awesome community of piano enthusiasts! If you have other questions about the functionality of PianoCareerAcademy.com, don’t hesitate to ask! Hi Ilinca. Recently when I have been practicing the piano I have felt tension and pain in my shoulders. I had a look at your video on warming up wrists and when I played my piece after the warm- ups, my shoulders were a bit better. But when I actually did the exercise, I felt that my arms were getting tired and a bit tense. You said in your video that while we are doing the warm- ups, it must not hurt. I was wondering if this is a common problem or is it just me? Is there something I can do so that my arms don’t hurt while doing the warm- ups and playing my piece? Thank you and if you have a minute, I would be most grateful for a reply! I will add that physical training and warm-ups are very important for our overall health and well-being – and also for making sure that our muscles are warm and loose before beginning our piano practice. However, physical exercises cannot solve problems (such as shoulder tension and pain) which appear as a result of an incorrect playing habit (learn more by clicking the link above!). What a wonderful set of exercises to apply specifically for maintaining well being during piano practice and performance! I also noticed how they happen to incorporate several different kinds of disciplines/traditions of well being. I especially appreciated learning about the exercise you suggest to get the blood flowing to the tips of our fingers! Thank you! Nice warm-up video. I just moved from guitar to piano since I find it more easy on scales, chord and the pleasant tone. I regularly practicing your warm-up techniques but still my fingers becomes numb after an hour. What mistake I am doing?? Take care. 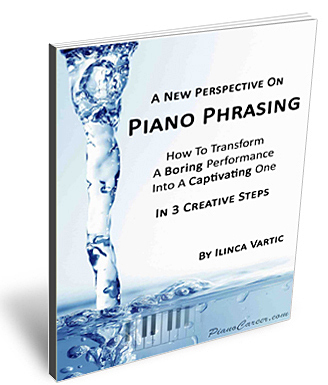 You will find a detailed article on this topic in our FAQs (http://www.pianocareeracademy.com/faqs/) at PianoCareerAcademy.com. This article can be found under question No. 31 – and and I recommend paying special attention to its 2nd half. If you have other questions about the functionality of PianoCareerAcademy.com (that are not covered in the FAQs), don’t hesitate to ask!